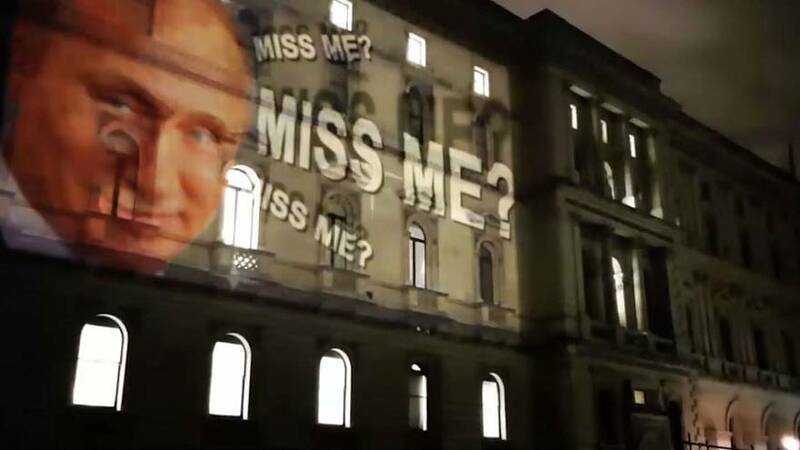 A video that appeared to show the face of Russian President Vladimir Putin being projected onto the British Foreign and Commonwealth Office (FCO) with the words "Miss me? ", is not real according to the UK government. Art group "Philosoraptors," who was claiming ownership of the video said they carried out the stunt on March 18 — the night Putin was re-elected after a landslide victory in the Russian presidential elections. An FCO spokeswoman told Euronews that the projection categorically did not happen. “This is not true,” she said. Philosoraptors group claimed: "We made this projection on the 18th of March. The main message is that it has become very popular to blame Russians and Putin for all misery and intentionally present them as enemy. By this projection, we decided to draw public's attention to this problem." The text used in the video "Miss me?" is an apparent reference to popular BBC series Sherlock Holmes. In the show, supervillain Moriarty made a dramatic comeback by projecting the same words onto screens, including those at London's iconic Picadilly Circus. Putin has previously said that he was used to being called "the main global villain" by some Western media. He added this didn't concern him as his main focus was the interests of Russia, "everything else does not interest me at all," he said. The stunt came as the UK and Russia were at loggerheads over the poisoning of ex-Russian spy Sergei Skripal and his daughter on British soil. The UK blamed Russia for carrying out the nerve agent attack, an accusation that Moscow denied.